I just won! So exciting...makes me want to hurry and finish writing my next novel! Austin, TX - Texas Association of Authors is proud to announce Northeast Texas author, Lynn Hobbs, has won 1st place is Religious Fiction for her book "Hidden Creek." This is the 3rd year in a row that Ms. Hobbs has won this award. 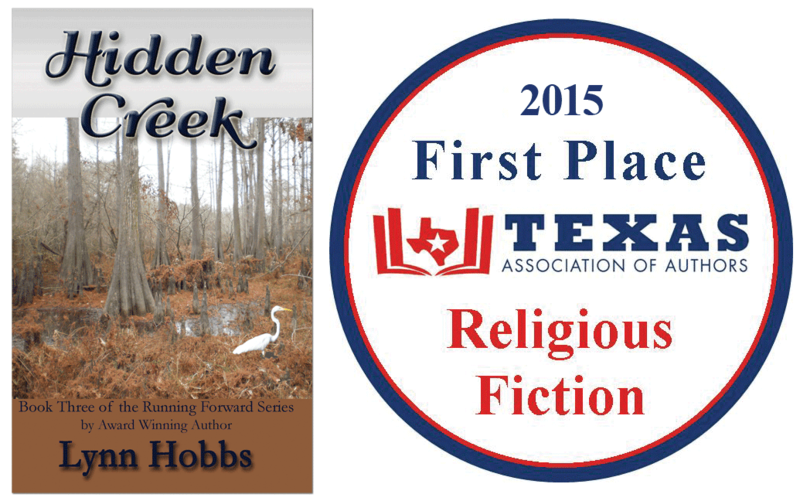 In 2013, her book, "Sin, Secrets, and Salvation," won 1st place in Religious Fiction, and in 2014, her book, "River Town," also won 1st place in Religious Fiction. This completes her "Running Forward Series," a powerful faith and family saga. "My goal in writing this series was to give the reader a complete understanding of a Christian viewpoint by the actions of my main character, Susan Penleigh. In dealing with modern family issues, her journey is followed with prayer and scripture that strengthens her faith. By the response the series has received, I believe my goal was reached, and I give God the glory! My 4th and current novel is a stand-alone book, and scheduled for publication this year. It will keep the same Christian standards as my previous books, and the new series I am writing." Available for purchase on TxAuthors.com, Amazon.com and Kindle, you may visit Ms. Hobbs at her website, www.LynnHobbsAuthor.com, or on Facebook, Twitter (@LynnHobbsAuthor), Goodreads, Linked-In, or TxAuthors.com.